I have 4 tables for the chat. Now I want to get comment_id's from from all the Tables(Table-2, Table-3, Table-4) and finally get comments using those comment_id's from Table-1 if the particular user in present in either of the tables. But here I don't know how to get the "GROUP BY A.id, ORDER BY A.id DESC LIMIT 7 OFFSET 0" working and don't know how to get the comments from Table-1 using the id's i get from union. 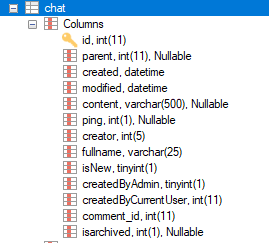 Table-1(activity) Table-2 (comments) Table-2(comments) id is connected to table-1(activity) as data-id. I am linking table-2(to know time and commented user etc) in table-1. Table-3(chat) The concept here is like one comment can have thread that is represented by chat. It will always be related to comment. Since you don't want any data other than comment Ids from Tables 2,3,4, why don't you use a simple IN clause? joining tables in mysql query?